American pianist Alan Chow, acclaimed for his performances of “poetry and virtuosic fire,” has been the First Prize winner of many international piano competitions including the Concert Artists Guild, UCLA, and Palm Beach Invitational; additionally, he was winner of the Silver Medal and Audience Favorite Prize at the Gina Bachauer International Piano Competition. He has been presented in concert in 45 states including recitals at Lincoln Center, Merkin Hall, Ravinia, and the Phillips Collection and concerto performances with the National Symphony, Utah Symphony, Oakland Symphony and Kansas City Symphony among others. Mr. Chow has made numerous tours of Asia with recitals and master classes at six conservatories in China, as well as in Japan, Hong Kong, Singapore and Taiwan, and concerto appearances with the Hong Kong Philharmonic. An avid chamber musician, he has been a guest artist at many festivals, performing with the American, Pacifica and Miami String Quartets. Mr. Chow studied principally with Nelita True, Sascha Gorodnitzki and Menahem Pressler. 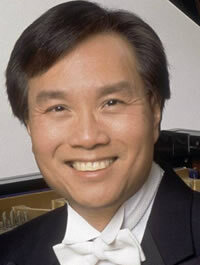 Formerly the Chair of the Piano Program, he is currently on the piano faculty at Northwestern University.